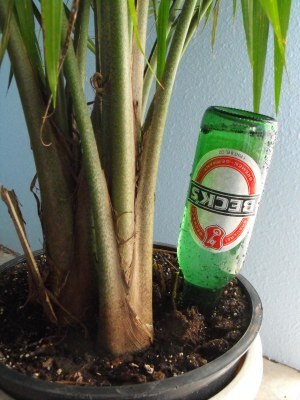 I don't know about you, but I don't think having beer bottles sticking out of my plant pots is the best look. Beyond the looks issue, I also wanted a more long term solution. I supposed it doesn't matter if your plants look un-classy if you aren't home to see it (like when on vacation) - but if I have to look at it every day, I want it to be cuter. With two small kids at home, plant watering can take a back seat. With my waterer, I can fill it once every 2-3 days and my plants stay happy. Plus I think it's super cute! If watching videos isn't your thing, here are the step-by-step instructions written out for you. Confused about part of it? Watch the video! Peel the label off your bottle. If there is still sticky residue on it, that's ok. We're going to cover it with glue anyway. If your marbles are dusty, be sure to clean and dry them, too! The best way to use the E-6000 glue is to apply glue to a small area of the bottle and then apply a little blob to the back of a handful of marbles. Set the marbles glue-side up for 2 minutes before adhering to the bottle in the area where you previously applied glue. 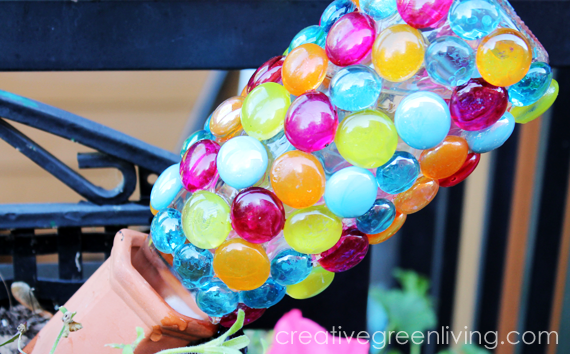 After you fill a small area with marbles, help hold them in place (and keep them from slipping off the bottle) with some masking tape. Set your bottle aside so the glue can cure for 24 hours before removing the masking tape. Some marbles might fall off after removing the masking tape - just re-apply them as above. Step 4: Use it in your garden! 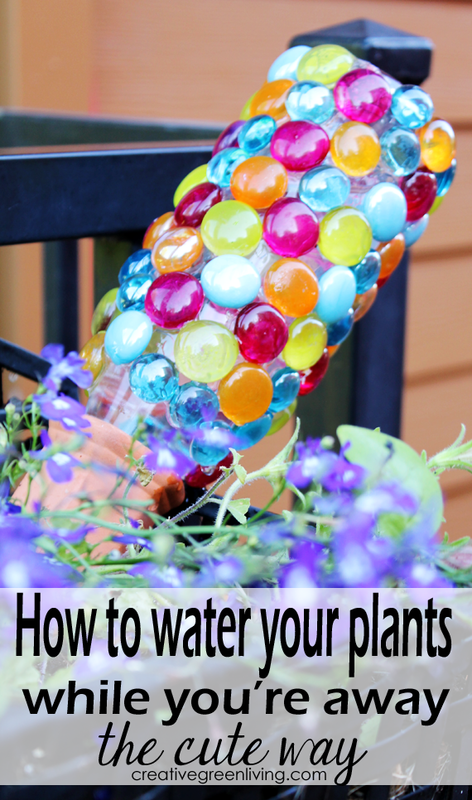 To use it in your garden, first water the plant so the soil is damp. Then insert the plant nanny into the dirt. Then fill your bottle with water and invert it into the stake! It works just as well for plants in the ground, in pots or window boxes. Just remember as a general rule, the larger your plant, the larger a bottle you'll need. Don't forget to pin this project for later! So cute. 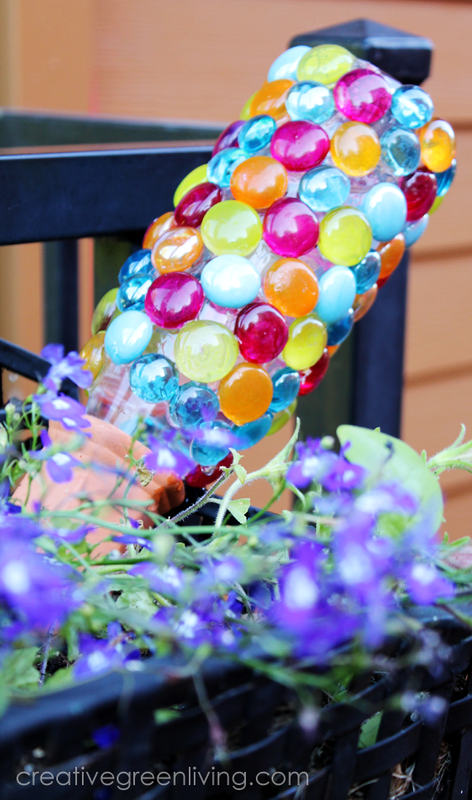 I love a little bling in the garden. Cute idea! I like this a lot more than just using an old bottle, so much more attractive. 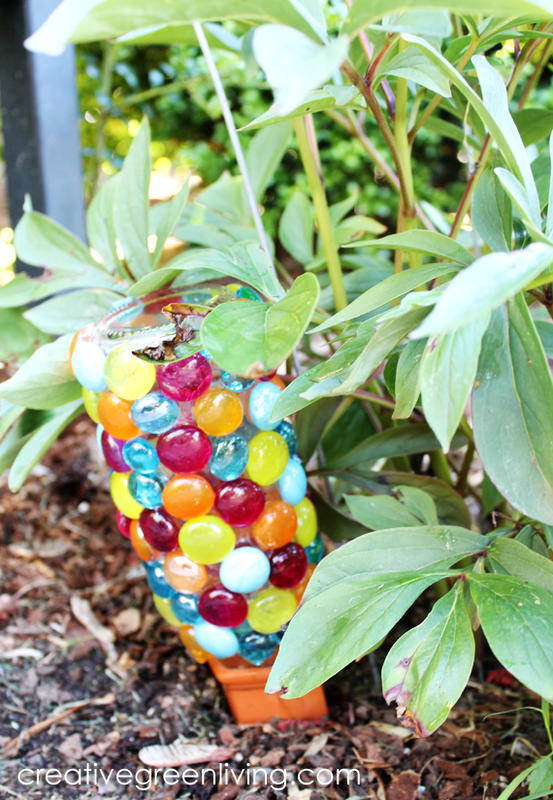 I really like this but, I'm going to use it for a hummingbird feeder instead of the water. Using bottles with screw tops allows for being able to insert into the bottom of some of my feeders that have broken and/or cracked. It's always the top piece that breaks, it seems. I love the colorful feeders but they can be pricey. Not these!